Love steampunk? Love making things yourself? 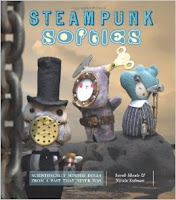 Check out these great DIY steampunk books. 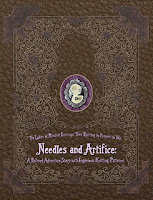 Needles and Artifice : a refined adventure story with ingenious knitting patterns edited by Shannon Okey. I love the idea of this book. Not only does it teach you some great patterns but you get a story too! "Gentle ladies and kind sirs: welcome to the world of Needles and Artifice, where corseted Victorian fashion gets an energized infusion of punk. In this fantastically playful take on steampunk knitwear design, the Ladies of Mischief offer not only 23 original patterns, but also a high-flying, busk-snapping adventure that plays out across each chapter. Pull on your goggles and spats, knitters: you're in for a wild ride" back cover. 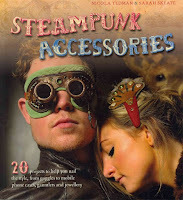 This book is a great starting place for that perfect steampunk outfit. My favorite project in this book is “the adventurer’s belt” which looks and sounds fabulous. This book will teach you how to make some truly unique dolls. I like that they all have a small backstory and fantastical names. Steampunk Tea Party: from cakes & toffees to jams & teas : 30 Neo-Victorian steampunk recipes from far-flung galaxies, underwater worlds & airborne excursions by Jema Emilly Ladybird Hewitt. Yum is all I can say about this book. I love the idea of a tea party, especially the sweets! 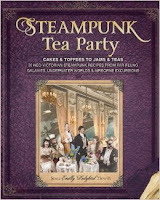 This book will help you throw the perfect steampunk tea party. It teaches you to make everything from “Gingerbread Woppits” to “Lunar Regimental Chutney”. "Join Miss Emilly Ladybird on a delicious adventure as she travels to fascinating destinations--just in time for tea! Whether enjoying a relaxing tea ceremony in Shangri-La or protecting Her Majesty's tea and cake against Martians, her exploits will be both tantalizing and tasty!" --From publisher.